The Stages Carbon Campagnolo Chorus Power Meter is now available and comes ride ready – with Campagnolo’s Ultra-Torque CULT ceramic non-drive bottom bracket bearing. The power meter features +/- 1.5% accuracy and 200 hours of battery life. Stages power meters run off the popular CR2032 battery and feature tool free battery replacement. In addition, it is extremely lightweight – adding only 20 grams to the weight of the crank arm. The power meter is compatible with both ANT+ and Bluetooth SMART devices, which means you can use your favorite bicycle computer as well as a smartphone or tablet. 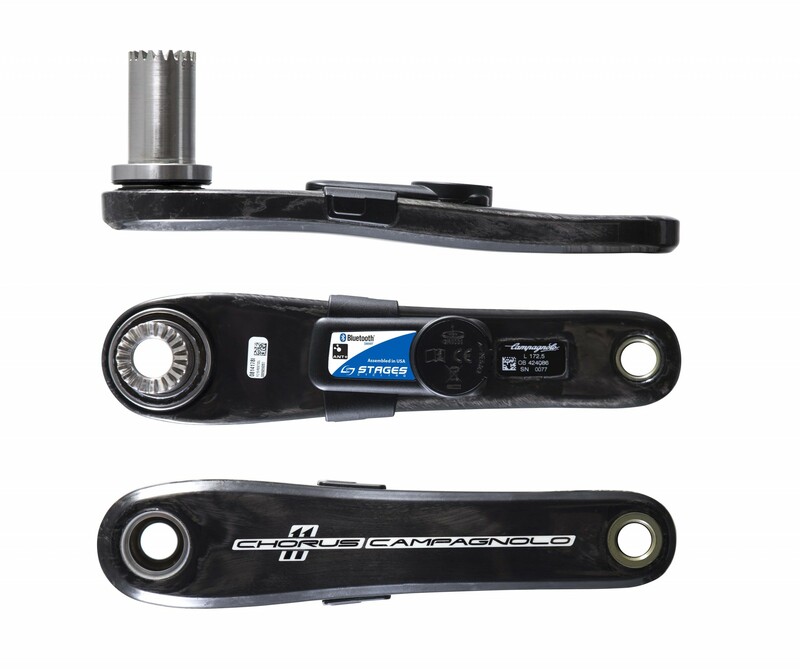 The Stages Carbon Campagnolo Chorus Power Meter is compatible with all existing Chorus model cranks. This should really be a 3.5 star, but I felt that 3 was a bit too harsh for what it really is, in my opinion (I’m no pro). I’ve bought the Stages PM as a replacement for a PowerPod which was perfectly fine on smooth roads, but on the crappy training roads that I have to ride around here, the unit was over estimating quite erratically. The Stages’ output is quite fine in that area. There are some caveats, though (which may be fixed in the future, according to Stages support). One of these is that the signal drops when using an out front mount for my head unit (tried with both a Garmin 520 and a 500). If the head unit is mounted on the stem, there are no drop outs at all. Note that my K-Edge out front mount was a bit less problematic than the Garmin one, but that might either be due to the material (aluminum vs composite) or the actual placement of the mount (Garmin puts the unit a bit to the RH, and the K-Edge a bit to the LH, but also a bit lower). Now, Stages points Garmin for the fault and Garmin points to Stages, but nonetheless, this is a factor that you have to keep in mind if you buy the power meter. Having said that, I was able to try the Dash SDL1 with the Stages PM and it works great. The Dash has issues of its own, if you ask me, but since it will connect to both Bluetooth and Ant+ simultaneously there are no dropouts at all, even in the out front position. Battery life appears to be good at this point, as after 40h of riding, the power level bar in the Stages Power app still shows almost a full bar.